Apple has introduced a new image format called HEIC/HEIF in the latest version of iOS 11 & MacOS High Sierra. HEIF (or High Efficiency Image Format) can drastically reduce the size of your photos, thus saving a lot of memory on your iPhone. This new image format is much better than the older JPG format in terms of quality, size, and processing. Currently, HEIF format isn't supported by non-iOS devices and most photo editor apps. This guide shows you how to convert HEIF photos to JPG on your Android phone. Let's first discuss the difference between HEIF and JPG. How HEIF is better than JPG? HEIF files are capable of capturing a broader range of colors and storing more data than JPG files. When it comes to quality, both HEIF and JPG images are almost same. HEIF files use improved compression technology that can compress photos and reduce size without affecting the quality. It will ultimately help save storage space on your iPhone. That's the main reason why Apple replaced JPG with the new HEIF format. Despite having many advantages over JPG, HEIF format has few disadvantages also. For example, as of now, HEIF photos are not supported by non-iOS devices, photo editor apps, browsers and websites. Apple recently rolled out a new feature that will automatically convert HEIF images to JPG when you share them with non-compatible apps. The easiest way to change one format image into another is by renaming its file format. Unfortunately, this method doesn't work on HEIF files as there is no actual conversion between two formats. Moreover, the applications aren't familiar with HEIF file so they can't open its equivalent JPG file also. First, download and install Luma app from Google Play Store for free. Open it and tap + (plus) button at the bottom of the screen. Now select single image or images folder from file directory. After selecting the photos, tap "Convert" button. If you don't want to install any third-party app on your phone, you can use an online tool like Apowersoft to convert HEIF photos to JPG in no time. All you have to do is, just upload the HEIF files on Apowersoft website and they are optimized and converted to JPG automatically. You can select up to 60 photos at once. There is no need to signup, subscribe and install any third-party plugins. If you want to transfer HEIF photos from iOS device to non-iOS device, you can share them on WhatsApp. WhatsApp will automatically convert photos to JPG, but it may also reduce the picture quality and size. 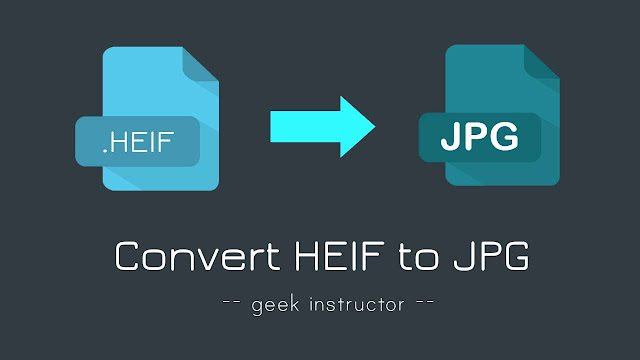 We hope you find this guide helpful to convert HEIF photos to JPG on your Android phone. If you want to ask something about this tutorial, please do share it in the comment section.